The numbers are impressive: Two national championships (and counting). Five perfect seasons since 1968. Dozens of All-Americans. Countless statistical milestones. But the numbers alone don't do justice to the impact that Penn State football has had and continues to have on its legion of fans. What takes place within the storied confines of Beaver Stadium is more than simply a game; it's a way of life. During the epic reign of the peerless Joe Paterno, an era that has seen Nittany Lion football escape its regional identity to become a dominant power on the national landscape, Penn State has become synonymous with college football excellence. From John Cappelletti's tearful Heisman acceptance speech, to the monumental upset of Miami that gave Paterno his second national title, to the 11-win 2005 season that silenced the critics who thought the game had passed Paterno by, the Nittany Lions have given their fans countless cherished memories—all within the context of a classy, team-first approach to football that is unique to Happy Valley. Coach Paterno puts it this way: "Those white uniforms are who we are. Hardworking, regular people who play by the rules and do it the right way. And we are a team. We may be individuals, but we play as a team. The team comes first. There is one name on the uniforms. Penn State." 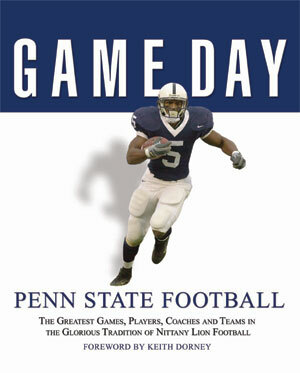 Game Day Penn State Football is a celebration of that pride that all Nittany Lion players and fans share, and of the decades of gridiron excellence that have inspired it.